"As Vyasadeva has compiled all the pastimes of Lord Krsna in Snmad-Bhiigavatam, Thakura Vrndavana dasa has depicted the pastimes of Lord Caitanya. Thakura Vrndavana dasa has composed Sri Caitanya-mailgala. Hearing this book annihilates all misfortune. By reading Sri Caitanya-mailgala one can understand all the glories and truths of Lord Caitanya and Nityananda and come to the ultimate conelusion of devotional service to Lord Krsna. The subject matter of this book is so sublime that it appears that Sri Caitanya Mahaprabhu has personally spoken through the writings of Sri Vrndavana dasa Thakura." There is an ancient village called Mamagachi located under the Purvasthali subdivision on the eastern side of the Burdwan District in West Bengal. According to older people as well as the author of Bhakti-ratnakara this village of Mamagachi is the area of Navadvtpa known as Modadrumadvipa. The Ganges River flows on the side of Mamagachi. Vrndavana dasa Thakura's worshipable Deities of Sri Sri Gaura-Nitai are worshiped in this village even today. It is said that Vrndavana dasa Thakura was born in this village. In this village one can still find Vrndavana dasa Thakura's house, where he grew up. The father of Malinidevt, Srivasa Pandita's wife, lived in the village of Marnagachi. Srivasa Pandita, the beloved devotee of Lord Gauranga, had a niece named Narayantdevl, who was married in this village. Malinidevi lived out her final days in this village at her father's house. Narayanidevi was married to a member of this family. Srlla Vmdavana dasa Thakura was born from the womb of Narayani. Since Vrndavana dasa Thakura lost his father early in childhood and his father left his body without being engaged in the service of Sri Caitanya Mahaprabhu, topics about his father are not mentioned anywhere. Some people say that because his father did not fully take shelter of the lotus feet of Lord Hari, Srila Vrndavana dasa Thakura was not identified by his paternal dynasty. Although the Deities of SrI SrI Gaura-Nitai installed by Srila Vrndavana dasa Thakura at the house of Malinidevi in Marnagachi have been shifted and are being served at another place, the service is not adequately prosperous and bright. Srila Vmdavana dasa Thakura spent a lot of time at Denduda. We have never heard of Snla Vmdavana dasa Thakura's married life. Among his four disciples, SrI Ramahari, who hailed from a kayastha family of north Radha-desa, was appointed by Vmdavana dasa as the sale heir to his assets at Denduda. His descendents still live at the house of Snla Vrndavana dasa Thakura in Denduda and continue their service there. Although Rarnahari was a pure devotee and was duly initiated, due to the prominence of smdrta practices, his descendants were forced to give up their traditional spiritual practices and follow smdrta principles. Although there is not much information about the paternal family of Srila Vmdavana dasa Thakura, it is understood that he appeared in a brohmana family of Radha-desa. Since his maternal family members were staunch followers of Sri Caitanya Mahaprabhu and the greatest householder Vaisnavas, Snla Vrndavana dasa Thakura is known through this relation among the Vaisnavas and in Gaudiya literature. Thakura Mahasaya, the son of Narayani, had great knowledge of devotional scriptures and was always engaged in preaching the glories of the Vaisnava acaryas with his mind, body, and speech. The society of smartas was envious of the Vaisnavas and envious of Sri Nityananda Prabhu. As such, they greatly disrespected Nityananda's servant Sri Vrndavana dasa Thakura and did not give him a very high position in their inimical-to- Vaisnava society. In fact they did not even refrain from slandering his family background. 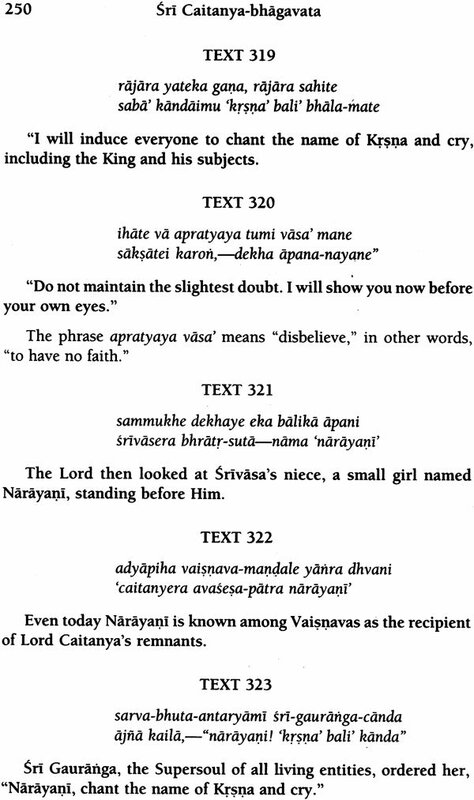 Just before Sri Gaurasundara left Navadvipa, Narayanidevi, the mother of Vrndavana dasa, was only four years old. Up to that time, she had been nourished by Sri Caitanyacandra's affectionate glance. Later, she lived with her husband in the house of Malini's father, where she raised her jewel-like son, Vrndavana dasa Thakura, up to his tenth year. Under the influence of the smdrtas, many less intelligent so-called- Vaisnava prakrta-sahajiyas of Radha-desa considered that Vrndavana dasa Thakura was not a brahmana. Actually Vrndavana dasa Thakura was a genuine, pure, topmost brahmana who did not accept subordination to the materialistic smarta community. Those who have studied Sri Cauanya-bhagavata, composed by this great soul, certainly know that Srila Vrndavana dasa Thakura was the topmost preacher of Sri Caitanya Mahaprabhu's philosophy of pure devotional service. Yet when Radha-ramana, the son of Madhusudana, the son of Balararna, the son of Sri Advaita Prabhu, lived at Santipura and desired to oppose the teachings of Advaita Prabhu, he accepted subordination of Sri Harihara Bhattacarya's son, who lived at Bandaghata; and when Sri Viracandra Prabhu's three disciples, who are celebrated as his sons, were compelled by the intimidation of smartas to place Durga, the wife of Tripurari, on the same throne next to Syamasundara; and when the marriage between Ganga Thakurani and a member of the Varendra caste was included in the Gangopadhyaya caste and thus socially approved in Radha-desa; and when Nityananda Prabhu, who hailed from a Maithila brahmana caste, married into the Sarakhela caste of Badagachi, Radha-desa, and at the same time accepted Uddharana Datta Thakura as a properly intiated brahmana-these unfavorable activities created various obstacles in Vrndavana dasa Thakura's propagation of the glories of the Vaisnava community. Still they were not able to stop the foremost devotee of Gaura for whom Nityananda was his life and soul, the brilliant sunlike personality of Gaudiya literature, Sri Vmdavana dasa Thakura, from writing the truth in Sri Caitanya-bhagavata. Those who have studied Sri Caitanya-bhagavata with full attention cannot be misguided from Srila Vmdavana dasa Thakura's presentation of the truth, which destroys all illusion. 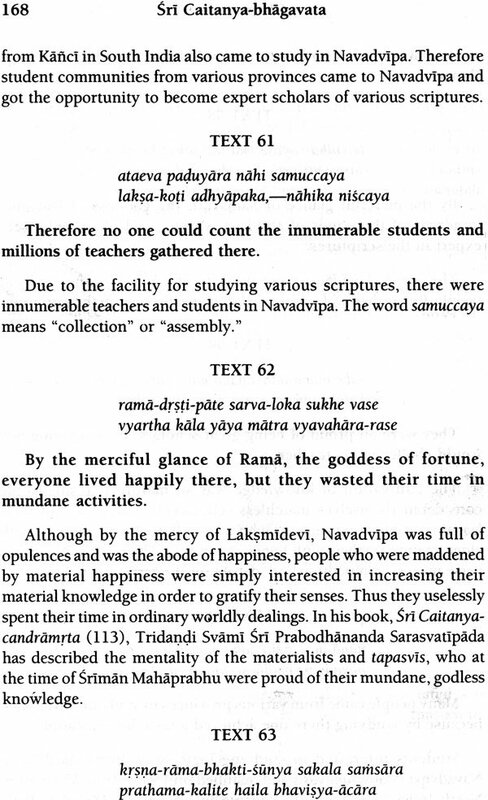 Wonderful social reconciliations of the conclusions of devotional service are written in golden words by Vmdavana dasa Thakura in various places throughout Cauanya-bhagavata. His service attitude towards his spiritual master, Sri Nityananda Prabhu, is incomparable. No scholar of that time-in Navadvipa, Gauda-desa, Bharata-varsa, or the world-could stand before him. Later on, however, there was no hesitation in attacking him and his family. There is no scarcity of ill-motivated people ready to attack the good qualities of Thakura Mahasaya. Some such envious persons said that Vrndavana dasa Thakura and his followers exhibited a great deal of negligence towards the nondevotees and were thus unable to attract less intelligent people to the banner of taror api sahisnuna and trnad. api sunicena, taught by Lord Caitanya. In answer to this, the followers of Sri Vrndavana dasa reply that it is very unfortunate that in the course of such criticism these people maintain an inimical mentality, which is averse to the process of devotional service, and cheat others by sitting on the back of morality in the dress of writers. Only due to a lack of piety does one dare to disregard the guru and the Vaisnavas in this way. The imprudent synthesizers, who with their opposing principles attempt to unite the universally beneficial principles of love of God, put forward many unreasonable arguments that are most fallacious and born of envy. Sri Vrndavana dasa Thakura was fully enlightened in the service of Lord Nityananda, his spiritual master, with his mind, body, and speech; therefore Sri Caitanyacandra did not give authority to such writers and foolish moralists to find fault with the activities of Sri Vrndavana dasa Thakura. Only when these fault-finders abstain from their dancing induced by the six material senses will they understand Snla Vmdavana dasa Thakura as the spiritual master of the Gaudiya Vaisnavas and repent for their offenses at his feet. It is with great satisfaction that we present this English edition of Srila Vmdavana dasa Thakura's Sri Caitanya-bhagavata for the pleasure of the devotees. We pray that this presentation will be accepted as our sincere attempt to glorify the Supreme Lord, Sri Caitanya Mahaprabhu. The descriptions found herein of the godless condition in society before Lord Caitanya's advent remind us of life before coming into the association of the devotees in the ISKCON society. Such a condition of life is indeed deplorable. We know both through the scriptures and through personal experience that only the devotees' sincere glori- fication of the Supreme Lord can act as a remedial measure to counteract the godless conditions that are so prominent in the age of Kali. Throughout Srila Prabhupada's books we are reminded again and again that topics of the Supreme Personality of Godhead are bhavaausadhi-"the right medicine fot the material disease." Srila Bhaktisiddhanta Sarasvati Thakura used to say, "There is no scarcity of anything within this world. The only scarcity is of Krsna consciousness." Therefore there is certainly no benefit to anyone if the preaching of Krsna consciousness is given up for social, political, or economic reasons. Srila Vmdavana dasa Thakura has divided this book into three parts-Adi-khanda, Madhya-khanda, and Antya-khanda. Although in the book he refers to the final part as the Sesa Khanda, we have followed the example of our founder-acarya, His Divine Grace A.C. Bhaktivedanta Swami Prabhupada, by using the word Antya in refering to the Lord's final pastimes. This English translation of the first eight chapters of the Adi-khanda is based on the first SrI Caitanya Gaudiya Matha edition, printed in 1987. We have made all efforts to present the purports of Srila Bhaktisiddhanta Sarasvatl Thakura in their complete form and have only occasionally tried to clarify in comments within brackets or in footnotes. A number of devotees helped inspire us to undertake the translation of Sri Cauanya-bhngavata. We wish to thank them all, and we hope that this presentation meets with their satisfaction. At this point we also wish to thank His Grace Rupa Raghunatha for his help in proofreading, His Holiness Bhanu Swami for translating some of the Sanskrit passages, Srimad Ananda Gopala Vedantatirtha Pandita for translating the balance of the Sanskrit passages, and His Grace Gopiparanadhana Prabhu for his help in translating part of the Introduction to the Gaudiya-bhasya. Then we offer our special thanks to His Holiness Bhakti Ballabha Purl Maharaja for his kind donation toward the printing. In preparing this book we have regularly consulted the other available English translations of Sri Caitanya- bhagavata, particularly that which was printed in Sr ila Bhaktisiddhanta Sarasvati Thakura's Hannonist magazine as well as those by Sarvabhavana and Kusakratha Prabhus. In closing, we wish to take the opportunity to humbly request the reader's blessing so that we may successfully present the balance of Sri Cauanya-bnagavata. Sri Caitanya-bhagavata is the biography of Sri Caitanya Mahaprabhu, the Supreme Personality of Godhead, who advented in Mayapur, West Bengal, just over 500 years ago. This book was originally entitled Caitanya-mangala,but when Srila Locana dasa Thakura later wrote another book named Caitanya-mangala, Srila Vrndavana dasa Thakura changed the name of his own book to Caitanya-bhagavata. Srila Vrndavana dasa Thakura has divided this book in three parts-Adi-khanda, Madhya-khanda, and Antya- khanda. Yet this work primarily deals with the first half of Sri Caitanya Mahaprahu's pastimes, while the Sri Caitanya-caritamrta primarily deals with the second half. With this volume our presentation of the Adi-khan4a is complete. This edition contains transliterations of the original text (initalics), English translation (in bold text), and translation of Srila Bhaktisiddhanta Sarasvati Thakura's commentary (in normal type face). The translation is based on the Sri Caitanya Gaudiya Matha first edition, printed in 1987. We have made all efforts to present the purports of Srila Bhaktisiddhanta Sarasvati Thakura in their complete form and have only occasionally tried to clarify with comments within brackets, , or in footnotes. A number of devotees helped inspire us to undertake the translation of SrI Caitanya-bhagavata. We wish to thank them all and hope that this presentation meets their satisfaction. At this point we also wish to thank Caitanya Devl Dasi and Indrani Devi Dasi for their help in typing, Gopala Prabhu for his help in proofreading, Pandita Srimad Ananda Gopala Vedantatirtha for translating the Sanskrit passages, Gopiparanadhana Prabhu for his help and guidance, and all other devotees who helped in various ways. We have regularly consulted the other available translations of Caitanya-bhagavata, particularly that which was printed in the Harmonist magazine, which was edited by Srtla Bhaktisiddhanta Sarasvati Thakura, as well as those by Sarvabhavana and Kusakratha Prabhus. Then we offer our special thanks to His Holiness Bhakti Ballabha Purl Maharaja for his kind donation towards the printing. Our future plan is to present the Madhya-khanda in two volumes and the Antya-hhan4a in one volume. While closing, we hope the reader will appreciate our attempt at presenting this important work in the English language and bless our efforts so that we may successfully present the balance of Sri Caitanya-bhagavata. Sri Caitanya-bhagavata is the biography of Sri Caitanya Mahaprabhu, the Supreme Personality of Godhead, who advented in Mayapur, West Bengal, just over 500 years ago. This book was originally entitled Caitanya-mangala, but when Srila Locana dasa Thakura later wrote another book named Cauanya-mangaia, Srila Vrndavana dasa Thakura changed the name of his own book to Cauanya-bhagavata. Srila Vrndavana dasa Thakura has divided this book into three parts-Adi-Khanda, Madhya-khanda, and Antya- Khanda-yet this. work primarily deals with the first half of Sri Caitanya Mahaprahu's pastimes, while the Sri Cauanya-caruamrta primarily deals with the second half. This edition contains transliterations (in italics) of the original text, English translation (in bold text), and translation (in normal type face) of Srila Bhaktisiddhanta Sarasvati Thakura's commentary. 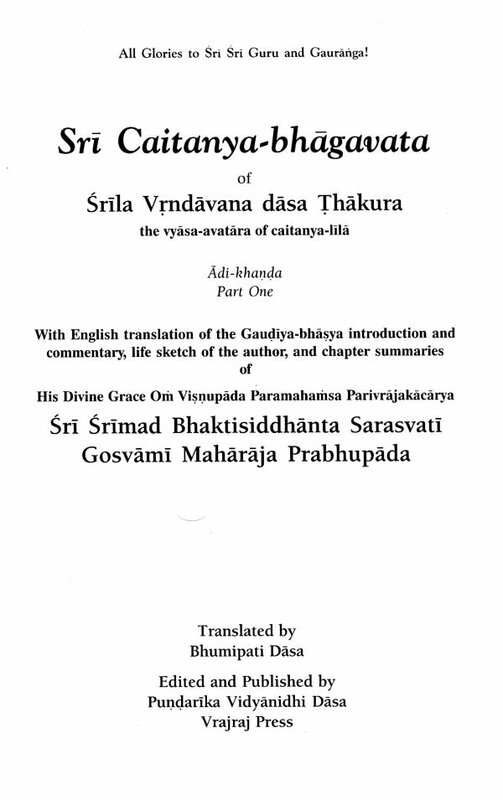 The translation is based on the first Sri Caitanya Gaudiya Matha edition, printed in 1987. We have made all efforts to present the purports of Srila Bhaktisiddhanta Sarasvati Thakura in their complete form and have only occasionally tried to clarify in comments within brackets or in footnotes. A number of devotees helped inspire us to undertake the translation of Sri Cauanya-bnagavaia. We wish to thank them all, and we hope that this presentation meets their satisfaction. At this point we also wish to thank Caitanya Devi Dasi and Indrani Devi Dasi for their help in typing, Gadagraja Prabhu for his help in proofreading, Pandita Srimad Ananda Gopala Vedantatirtha for translating the Sanskrit passages, Gopiparanadhana Prabhu for his help and guidance, and all other devotees who helped in various ways. We have regularly consulted the other available translations of Caitanya-bhagavata, "particularly that which was printed in the Harmonist magazine, which was edited by Srlla Bhaktisiddhanta Sarasvati Thakura, as well as those by Sarvabhavana and Kusakratha Prabhus. This third volume in our series begins our presentation of the Madhya-Khanda, which we now plan to present in three volumes. "On the other hand, that literature which is full with descriptions of the transcendental glories of the name, fame, form, and pastimes of the unlimited Supreme Lord is a transcendental creation meant to bring about a revolution in the impious life of a misdirected civilization. Such transcendental literatures, even though irregularly composed, are heard, sung, and accepted by purified men who are thoroughly honest." In closing, we pray that the appreciative reader may kindly bless us so that we may attain association with the devotees and service at the lotus feet of Srila Prabhupada, birth after birth. Sri Caitanya-bhagavata is the biography of Sri Caitanya Mahaprabhu, the Supreme Personality of Godhead, who advented in Mayapur, West Bengal, just over 500 years ago. This book was originally entitled Caitanya-mangala, but when Srila Locana dasa Thakura later wrote another book named Caitanya-mangala, Srila Vrndavana dasa Thakura changed the name of his own book to Caitanya-bnagavata. Snla Vrndavana dasa Thakura has divided this book into three parts-Adi-khanda, Madhya-khanda, and Antya- khanda-yet this work primarily deals with the first half of Sri Caitanya Mahaprahu's pastimes, while the Sri Caitanya-caritamrta primarily deals with the second half. This edition contains transliterations of the original text (in italics), English translation (in bold text), and translation of Srila Bhaktisiddhanta Sarasvati Thakura's commentary (in normal type face). 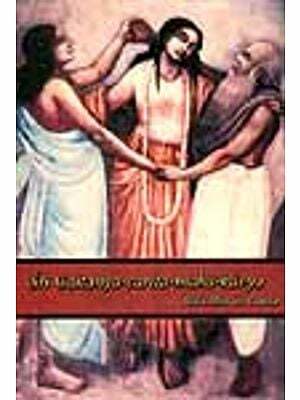 The translation is based on the Sri Caitanya Gaudiya Matha first edition, printed in 1987. We have made all efforts to present the purports of Srlla Bhaktisiddhanta Sarasvati Thakura in their complete form and have only occasionally tried to clarify in comments within brackets, , or in footnotes. A number of devotees helped inspire us to undertake the translation of Sri Caitanya-bhagavata. We wish to thank them all and hope that this presentation meets their satisfaction. We wish to particularly thank our Godbrother Laksmana Prabhu for donating a computer, Caitanya Devl Dasi and Indrani Devi DaSI for their typing and other support, Gadagraja, Dhruva Maharaja, and Haridasa Thakura Prabhus for their help in proofreading, Pandita Srimad Ananda Gopala Vedantatirtha for translating the Sanskrit passages, His Holiness Bhakti Sarvasva Govinda Maharaja and Gopiparanadhana Prabhu for their guidance, Saccitananda Prabhu for painting the cover, Kurma Rupa Prabhu for the cover layo Bhakti Ballabha Purl Maharaja for his support, and all other devotees who helped in various ways. We have regularly consulted the other available English translations of Caitanya-bhagavata by Sarvabhavana and Kusakratha Prabhus, so we are also naturally obliged to them. Therefore while closing we request the reader to bless our efforts so that we may successfully present the balance of Sri Caitanya-bhagavata. "On the other hand, that literature which is full with descriptions of the transcendental glories of the name, fame, form and pastimes of the unlimited Supreme Lord is a transcendental creation meant to bring about a revolution in the impious life of a misdirected civiliation. Such transcendental literatures, even though irregularly composed, are heard, sung and accepted by purified men who are thoroughly honest." Therefore while closing we request the reader to bless our efforts so that we may successfully present the balance of Sri Caitanya - bhagavata.